When you have a jammed garbage disposal, we're here with repair tips. This 1-minute video shows you how to fix and repair a disposal that's jammed, stuck, or has stopped working. 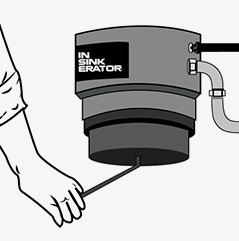 Every InSinkErator is shipped with a self-service wrench. The wrench is silver colored, and shaped like a little crank, about four inches long. If you cannot find the wrench, you can use a standard 1/4-inch Allen wrench, or click here to order a replacement. Make certain that the disposal's switch is in the off position. Do not place your hand in the disposal at any time. If the sink is full of water, wait for it to drain, or bail the water out using a bucket or pot. Insert the wrench into the hole at the bottom of the disposal. 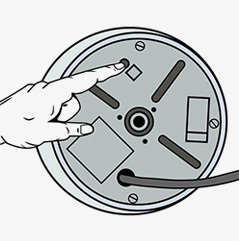 (See Fig 1) The hole is located under the sink at the bottom of the disposal, dead center, facing the floor. Use the wrench like a crank. Work the wrench back and forth in both directions. If the wrench will not turn easily, it is OK to use some force. The wrench is designed to bend before any damage is done to the disposal. Continue working with the wrench. (See Fig 2) The overload protector is located under the sink, on the bottom of the disposal, facing the floor. It is a small square red button. If the overload protector has tripped, you will see the red button dropped down about a quarter of an inch (5mm). Gently press the red button. If it does not stay up, wait ten minutes and try again. Check inside disposal's grinding chamber. Look down into the disposal using a flashlight. Do not place your hand into the disposal. Pay special attention to the area around the outer edge of the disposal's shredding disk where you see the little teeth. If you see anything in the disposal, remove it using tongs or pliers. Turn on the water, then the disposal. The disposal should now run. If it jams again, use the wrench again. You may need to repeat the process several times. If the disposal continues to jam, it may need service. If the problem with your disposal is due to defects in materials or workmanship, InSinkErator ma​y pay to have an authorized service center service the disposal in your home at no charge to you.